The United States is a multiethnic country with a diverse society. As one of the most influential counties in the world, it faces a wide range of social problems and hot topics. 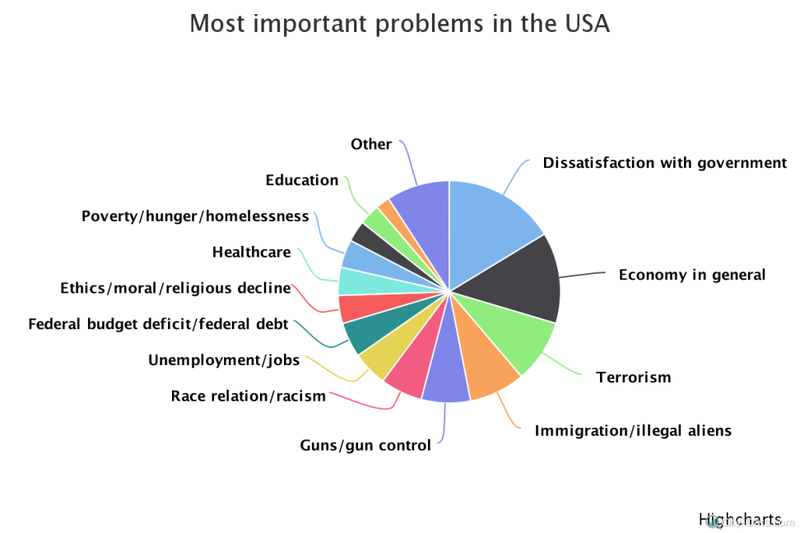 According to information published by Statista, the most important problem in the United States in 2015 was the public’s dissatisfaction with the government – 17 percent of respondents named this issue as the most important. About 15 percent stated that the country’s economy in general as the biggest problem in America, while 12 percent said that immigration and illegal aliens were the most important. According to 8 percent of the surveyed Americans, the biggest problem in the country was unemployment and jobs. The issues of ethics, religious decline and racism were named by 7 percent of respondents. Healthcare in the United Stated is a widely-discussed issue. The country spends more on healthcare and drugs than any other developed nation, but Americans still don’t live as long as they should and often die from treatable diseases, according to Businessinsider.com. About 6 percent of Americans think that the issue of healthcare is the most important in the country. Around 5 percent of people worried most about the federal budget deficit and federal debt in 2015. The education and judicial systems were also on the list of problems, at 4 percent each. Three percent of Americans said the following problems were the most important: the gap between rich and poor, national security, crime and violence, international issues and problems, poverty and homelessness, foreign policy and lack of money. In 2015, about 2 percent of the participants stated that terrorism, gay rights issues, environment and pollution, guns and gun control among the biggest problems that country faced.